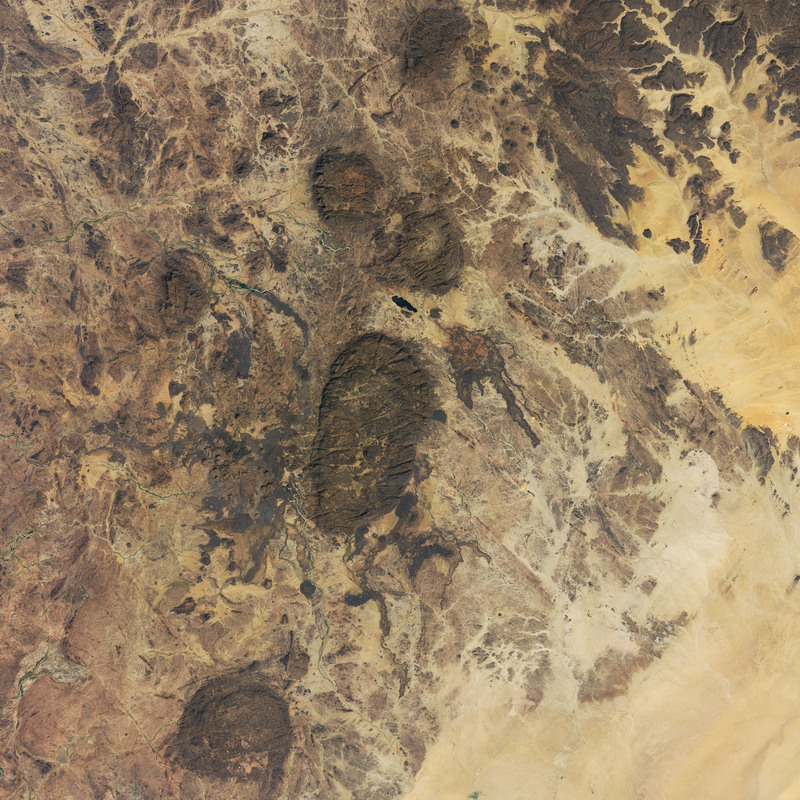 Dispersed across the Sahara Desert in northern Niger, the Aïr Mountains rise sharply from the low-lying sea of sand to provide unique scenery, aesthetically and geologically. The mountain range hosts volcanic peaks, is traversed by deep valleys, and makes up one of the world’s largest ring dike structures—a rare circular feature born from early volcanic activity. The natural-color image above shows a few of the ring dike structures that enclose granite massifs. 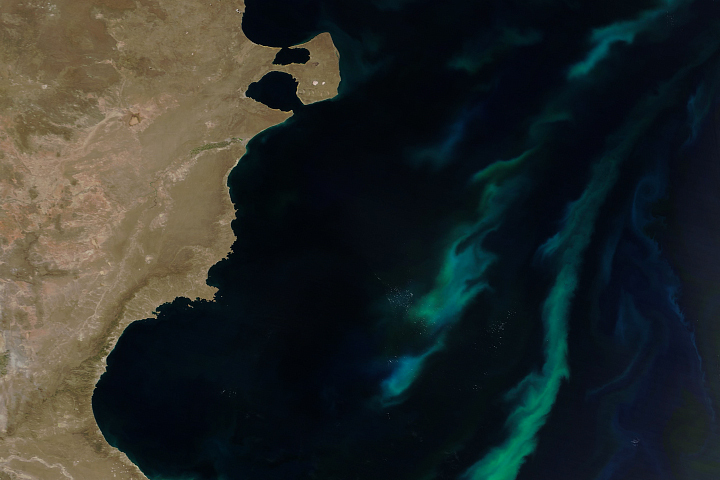 The image was acquired by the Operational Land Imager (OLI) on the Landsat 8 satellite on October 31, 2018. 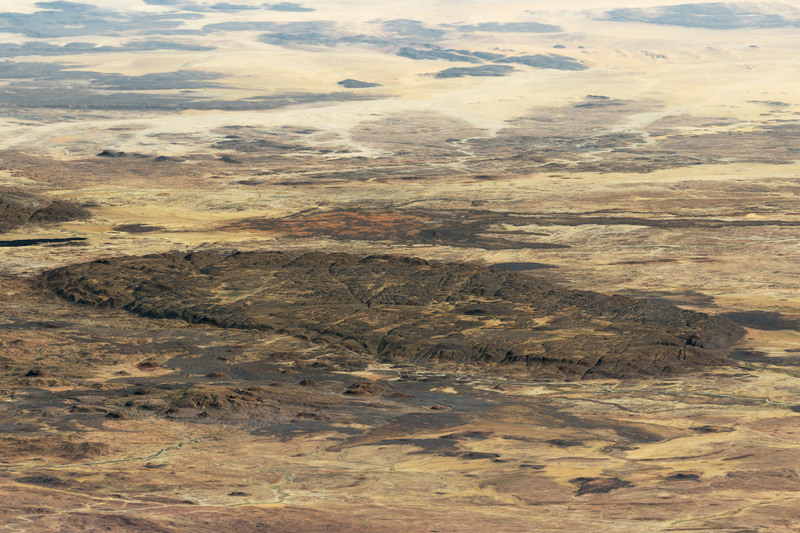 The scene highlights the stark contrast between the mountains and the surrounding lowlands, such as the Ténéré Desert to the west. In total, the Aïr Mountains extend across 84,000 square kilometers (32,000 square miles) and include the tallest peaks in Niger. 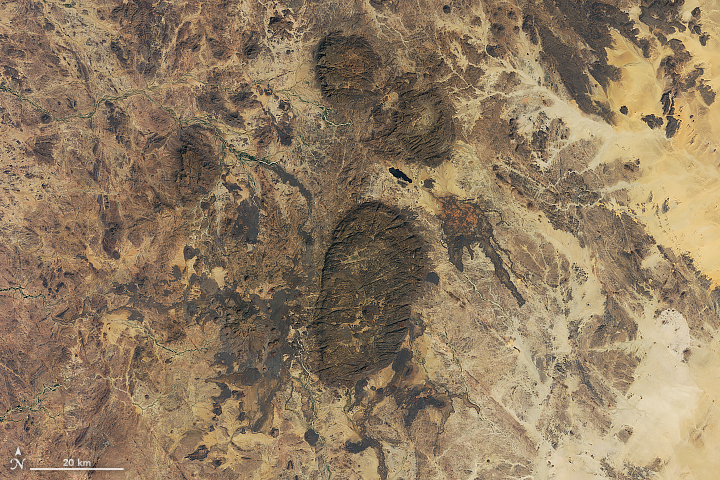 The formation of this range dates back to Precambrian times, the earliest of Earth’s eons. The Aïr Mountains formed when magma flowed into pre-existing cracks and caverns in the bedrock, a geologic formation called a dike. 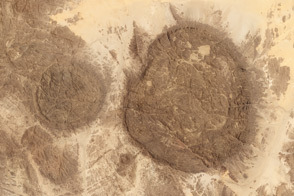 Ring dikes are bubble-shaped mounds that form when the ceiling of a magma chamber collapses, leaving a circular crack that is later filled again with magma. Through time and the constant movement of Earth's crust, such magma intrusions get lifted and moved together to create mountains. 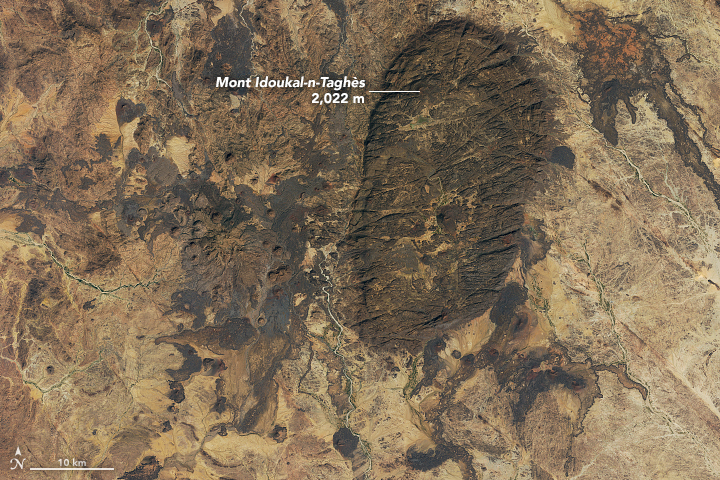 The image above shows the Bagzane Plateau, home to the highest point in Niger: Mont Idoukal-n-Taghes. The summit stands 2,022 meters (6,634 feet) above sea level. The image below gives a sense of the plateau's topography. 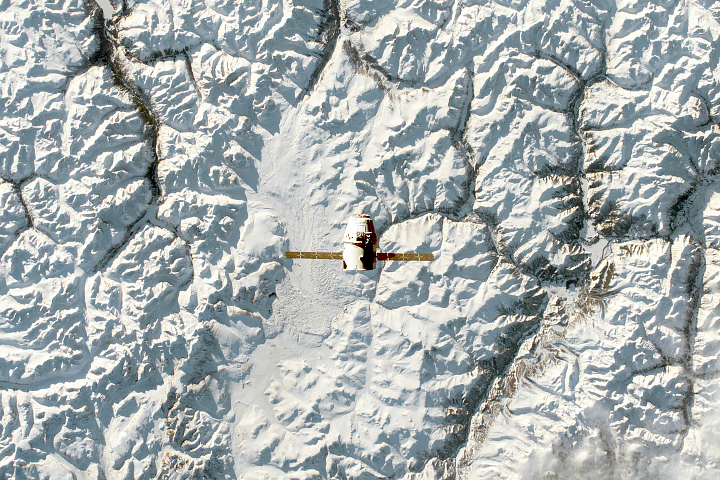 The image was made by overlaying the Landsat image over elevation data acquired by the Shuttle Radar Topography Mission (SRTM). Compared to the surrounding desert, the Aïr Mountains are a relatively green region that supports a variety of wildlife and fauna that have been eliminated in other regions of the Sahara and Sahel. The mountains are an ecological island of Sahel climate—hot and sunny, with seasonal rains. The mountain landscape provides a habitat for three threatened antelope species, as well as important populations of the fennec fox, Rüppell’s fox, and cheetah. Several seasonal streams support farming and livestock grazing. The region also includes hot springs, uranium mines, and ancient rock carvings dating from 6,000 BCE to 1000 CE. Because of its unique landscape and wildlife, the Aïr and Ténéré Natural Reserve was designated as a UNESCO World Heritage site in 1991. One year later, it was placed on the List of World Heritage Sites in Danger. The Aïr Mountains sit within one of the largest protected areas in Africa. NASA Earth Observatory images by Joshua Stevens, using Landsat data from the U.S. Geological Survey, and topographic data from the Shuttle Radar Topography Mission (SRTM). Story by Kasha Patel. The Aïr Mountains stand out, aesthetically and geologically, from the surrounding low-lying plains to support unique wildlife. Defense Language Institute Foreign Language Center County in Perspective Niger. NASA Earth Observatory (2013, December 4) Aïr and Ténéré Natural Reserves. UNESCO Aïr and Ténéré Natural Reserves.. Accessed December 19, 2018. USGS (2016, August 31) Aïr Mountains. Accessed December 19, 2018.